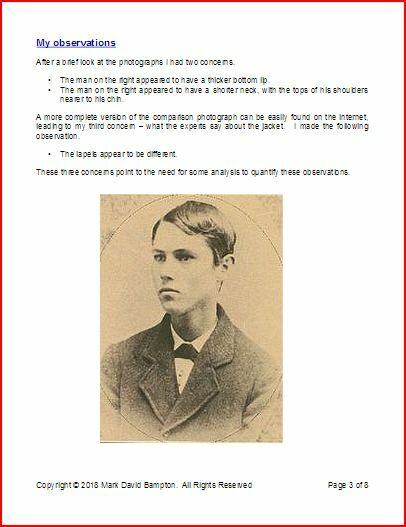 The eBay find of Justin Whiting of the UK was promoted worldwide as being an image of Jesse James. Decrying Whiting as a fraud and a merchant of identity theft, the James family enjoined Mark David Bampton of Great Britain to analyze the image and make public his findings. 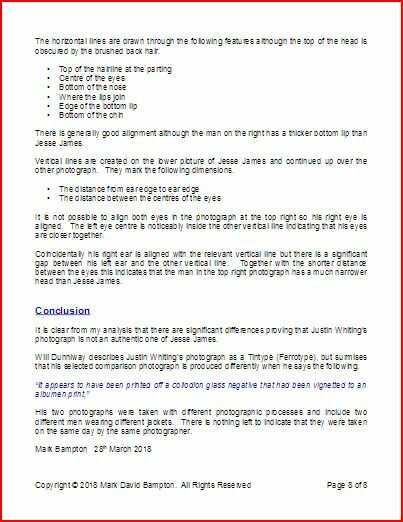 Below is Bampton’s entire report for free download, plus highlights of his findings. HOVER over slideshow for directional pages. There is generally good alignment for most lines. 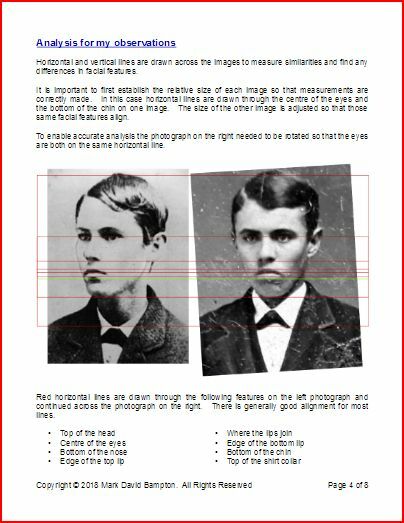 The distance between the bottom two lines indicates that the man on the left has a significantly longer neck than the man on the right. The parts of the yellow line marking the tops of the shoulders are significantly below the shoulders highlighted with red lines. 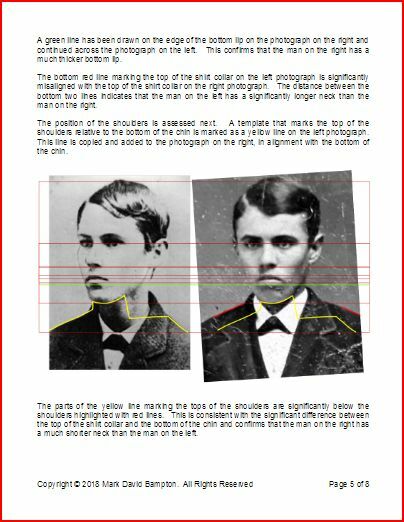 This is consistent with the significant difference between the top of the shirt collar and the bottom of the chin and confirms that the man on the right has a much shorter neck than the man on the left. 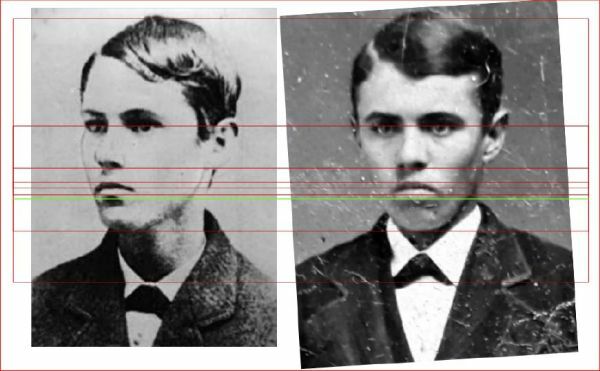 There is considerable misalignment of the template and the lower part of the lapel in the right hand photograph is significantly wider than in the left photograph. The lower part of the lapel is also much longer as highlighted by the length of the yellow template line. In contrast to what the experts say these are definitely different jackets in each photograph. The horizontal lines are drawn through the following features although the top of the head is obscured by the brushed back hair. 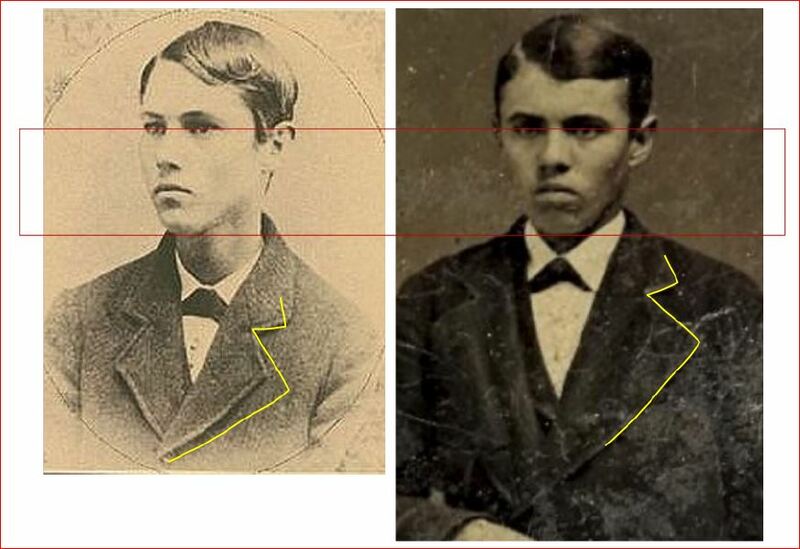 There is generally good alignment although the man on the right has a thicker bottom lip than Jesse James. 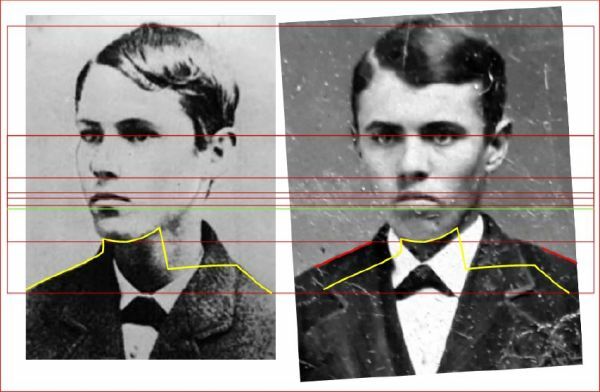 Vertical lines are created on the lower picture of Jesse James and continued up over the other photograph. They mark the following dimensions. Coincidentally his right ear is aligned with the relevant vertical line but there is a significant gap between his left ear and the other vertical line. 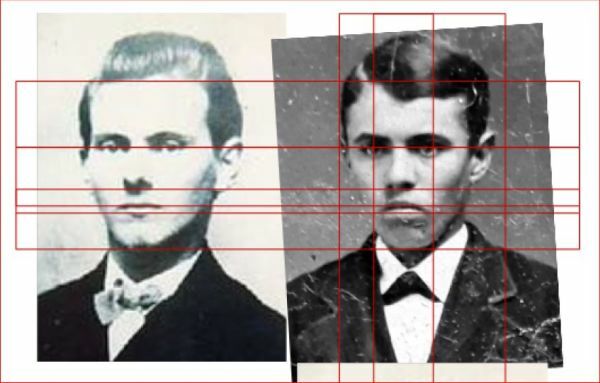 Together with the shorter distance between the eyes this indicates that the man in the top right photograph has a much narrower head than Jesse James. 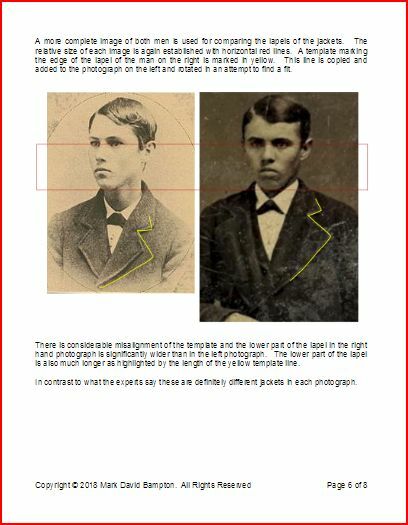 His two photographs were taken with different photographic processes and include two different men wearing different jackets. There is nothing left to indicate that they were taken on the same day by the same photographer. In the worldwide publicity Justin Whiting promoted, Whiting advertised that his “7£ eBay find” was headed to Christie’s in London. There, Whiting imagined he would reap at auction a $2 million dollar windfall that the experts Whiting consulted told him to expect. On March 31, 2018, Christie’s notified Whiting in writing that his artifact was not suitable for consignment. Christie’s further requested that Whiting refrains from associating Christie’s name with his promotion. In America, the New York Post formerly followed The Telegraph in first reporting the Justin Whiting’s story. Now The Post walks away from the story, too. The story of Justin Whiting and his “7£ eBay find” is a story of self-delusion, false hope, and cognitive dissonance, abetted by unscrupulous enablers, all whom wilfully sidestep reason and critical thinking for the dream of fleecing the public of an exorbitant amount of money. That is a crime unworthy of the name of Jesse James. 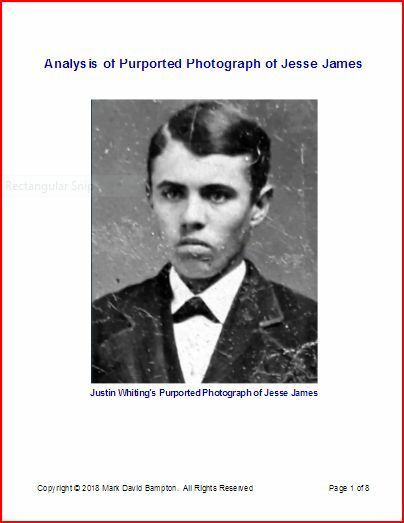 Mark David Bampton appeared in America in September 2018 to present his paper and findings in the Bob Ford/Jesse James Photo Hoax, at the 2018 conference of the James-Younger Gang and family. 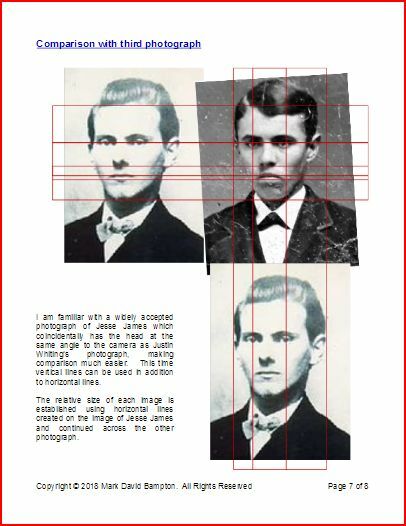 He also is noteworthy for his work in debunking claims in the Jesse James ambrotype claim. 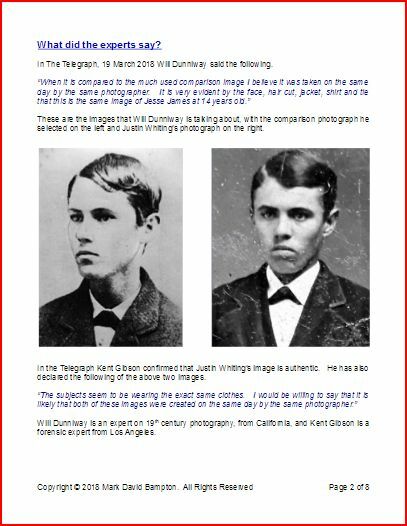 Bampton also is noted for his analysis and findings in the Robert Johnson Photo Hoax. “I was born and have always lived in the UK. 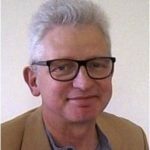 Since 2000, I have lived in Ampthill, which is a small Georgian town in Bedfordshire. “From my formative years, I was interested in a mixture of the arts and technical subjects, moving on to complete an art foundation course. There I decided to pursue a career in industrial design, combining both artistic and technical demands. “My career progressed into product engineering and development. I became interested in quality management and moved into this discipline through establishing management systems and achieving ISO9001 certification for my employers. This included some project management.